Enabling communication in disaster zones via mesh networking and drone-facilitated data transfer. When a natural disaster occurs, power and communication infrastructure can get damaged and stop functioning. It often takes weeks (or months) for power and communication to be fully restored. Backup generators can provide emergency power, but the inability for disaster survivors to communicate with both loved ones and first responders is a critical unmet need. The Drone Mailman service addresses this challenge in a unique way. Mesh-networked wireless access points are placed at resilient locations throughout a vulnerable area. When a disaster strikes and the internet and cell towers go down, an emergency local network persists. Survivors compose messages via a locally-served web page, and their responses are saved to a database. Finally, a drone operated by a first responder flies near the database, downloads the survivor responses, and returns to the drone pilot to be uploaded to a cloud platform. My master’s program capstone team was matched with Eaton, a global power management company. They came to us with the broad goal of designing in the disaster resilience and recovery space. Our team was thus tasked with researching to find the area where Eaton could make the biggest impact, and designing something in that area. Eaton’s products are probably in the building you’re in right now, but you probably don’t realize it. As a company that makes infrastructure-based products, they are inherently out of the public eye. Thus, in addition to humanitarian reasons, Eaton’s motivation for entering the disaster recovery space is rooted partly in public perception. They want the general public’s first exposure to Eaton to be a positive one. A company with Eaton’s technical and intellectual resources can do massively beneficial things for the world, and this project is one such example. I’m our team’s Technical Lead. The other project roles are Research Lead, Design Lead, Project Manager, and UX Specialist. With that in mind, the actual work distribution is much more amorphous, and each team member wears many hats. I have done a significant amount of research and design work in addition to owning the technical components of the project. The goal of the first half of the project is to decide on a concept to pursue and refine. This would require conducting research and performing generative design to narrow on the design that best acknowledges our client’s needs. Our first major task was to narrow down the broad domain of “disaster relief” to something actionable and concrete. Would we focus on natural or man-made disasters? Would we focus on infrastructural effects, like power outages, or something more interpersonal? On top of all of that, how can we best utilize Eaton’s technological and intellectual resources? To answer these questions and narrow our scope, we needed to conduct research in a thoughtful and directed way. In planning our research sprints, we adapted a classic human-centered design concept: the double-diamond. Traditionally, the first part of a double diamond is a period of discovery research (the diamond expansion) followed by narrowing and defining the problem space (the contraction). The second part of the classic double diamond is another expansion period for generating many solutions, followed by a narrowing and picking out good solutions. We adapted the process to fit our needs by having many sequential iterations of this first diamond. We ran two week-long research sprints to progressively narrow our design space into something concrete and actionable. Initially, we didn’t know what we didn’t know about disasters. When this project began however, Hurricane Maria coverage was all over the news, and it seemed there were numerous unsolved problems associated with it. This drove our decision to focus on natural disasters. After doing a bit of general research, we assigned different team members concepts to research more in-depth. For example, I spent part of a sprint specifically researching “renewable energy and disasters”, hoping for a potential lead on a problem area. This research consisted of both reading articles from news publications and from reading white papers published by organizations like the UN. Research was conducted independently and then shared with the whole team in a round-robin setting. This prompted discussion about which topics warranted further and more specific research. While we conducted secondary research, we also contacted experts in a variety of fields related to natural disasters and potential solutions (LinkedIn search is your friend). Our interviewees ranged from a Red Cross Hurricane Recovery Director, to a FEMA Emergency Manager, to a PhD student working with microgrids. These interviews allowed for more pointed questioning and for insights into what experts saw as deeper problems. After a few sprints, we narrowed into focusing on hurricanes and power-related problems. 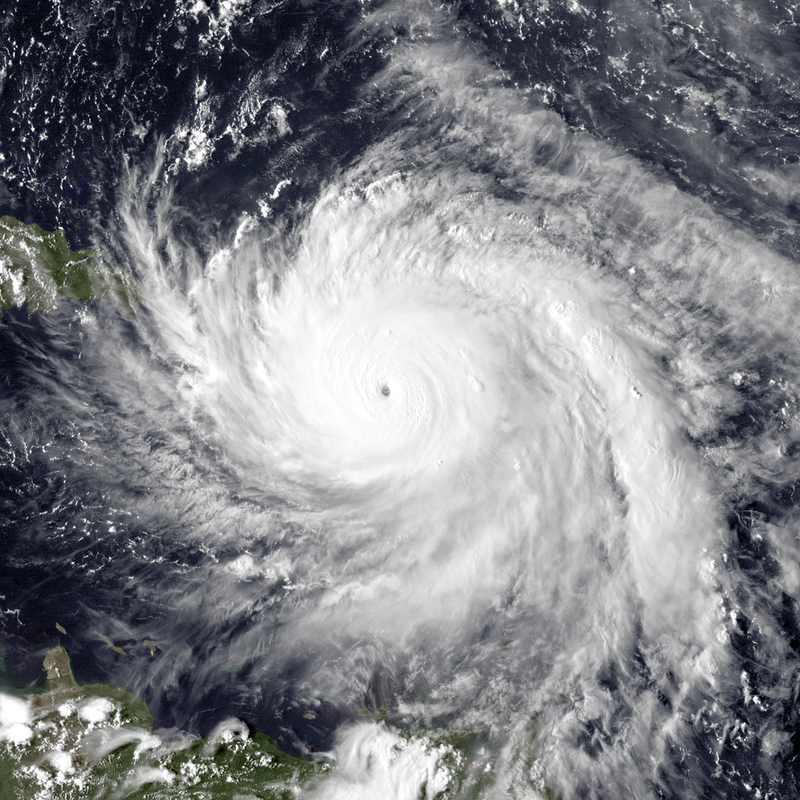 The devastation created by Hurricane Maria weighed heavily on our research, and numerous problems with power infrastructure seemed to emerge. To better understand these problems, we arranged a trip to Puerto Rico to experience the situation firsthand. We arranged a trip to an Eaton manufacturing plant in Arecibo to interview local employees. We also set up a few interviews with local charities and friends-of-friends. The gallery below comprises of pictures I personally took on our trip. The rest of the photos are from news articles and other sources. 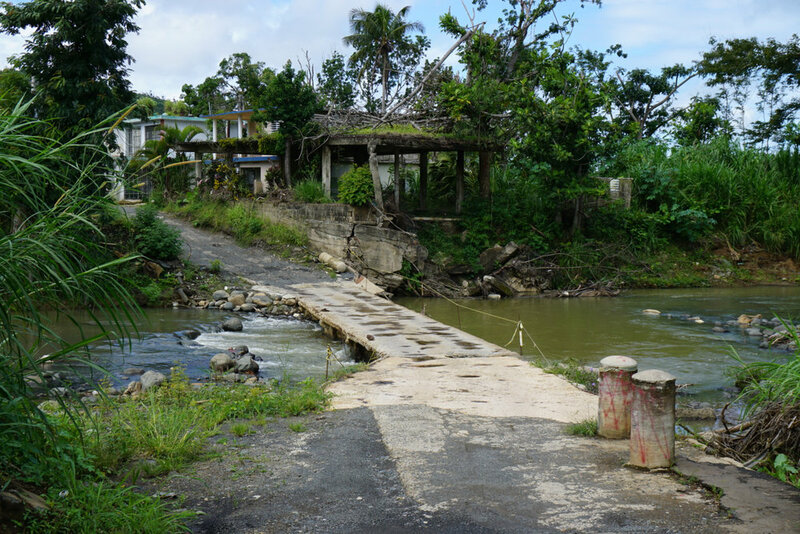 When a nearby bridge was destroyed by Maria, cars and trucks resorted to this for crossing a river. This is where the road we drove on ended. It was completely destroyed by a landslide caused by Maria. These people lived about 30 feet from the landslide in the previous picture. Their house was unaffected. We ended up learning more than we could’ve imagined. We ended up talking, unplanned, to store owners, civilians with damaged houses, emergency aid workers, and a PREPA Engineer, in addition to our scheduled interviews. We learned an assumption we had made coming into this trip, that electric power was the biggest problem, was wrong. Across the board, civilians that had lived through the hurricane told us communication with loved ones was the primary source of distress. They could live without power for a few weeks, but being unable to tell their family they were okay was crucial. Cellular service across the island was mostly blacked out by Maria. We heard stories about people driving miles on the highway, searching for a patch of cell service to call family. On top of that, there was a sense that FEMA and other aid organizations were not aligned with civilian needs and priorities. To make sense of our interviews, we made affinity diagrams from interview notes. This allows for common concepts across a variety of different interviews to bubble up to the top. The main appeal of an affinity is synthesizes an unwieldy amount of raw data into what is essentially a list of concepts. We made affinity diagrams separately for expert interviews and for our Puerto Rico interviews. For the Puerto Rico data in particular, we made personas and journey maps to represent the needs and context of our target users. In this case: disaster survivors, first responders, and survivor family members. These artifacts proved critical for a variety of reasons. By mapping out a user’s high and low points throughout their experience, critical opportunities for design are revealed. In addition, having a name and face to refer to is useful when generating designs: from this point forward, we were designing for “Carla”, our disaster survivor persona. After synthesizing weeks of primary and secondary research, we began our generative design phase. This is another series of sprints, and represents the second diamond of the Double Diamond concept mentioned earlier. These sprints were about a week long and had specific exercises devoted towards generating many design sketches followed by narrowing the field. Based on our synthesized research, five technical areas for solutions emerged: satellite communication, peer-to-peer networking, renewable energy, data collection and gathering, and disaster preparedness. Initially, our ideations were broad and informal, since the intention was to create ideas and avoid getting fixated on one. We each came up with 40 sketches, 8 for each technical area. We then came together and viewed everyone’s sketches museum-style. To narrow, we used stickers to vote on our favorite ideas. By the end of this activity, we had a top five to move forward with. Over the next few weeks we performed similar exercises, fleshing out our previous week’s idea in various ways followed by critique and decision-making. My personal favorite exercise involved using paper cutouts to enact a design (no drawing required!). In fact, our eventual final idea emerged from this exercise. Our final concept is codenamed “Drone Mailman”. We saw the communication and internet blackout as a critical place to innovate. Civilians are so used to communicating digitally with their loved ones, and it is traumatic when that communication line is severed. Disaster survivors often have some way of charging their phones (and other necessary appliances), for example using a gas-powered emergency generator. However, there is no way to connect to the internet. Drone Mailman provides temporary relief by delivering messages the old-fashioned way: by physically going somewhere and delivering them. Using wifi and cell phones, users connect to a local area mesh network and compose messages using a web application housed on a local server. This network is not connected to the main internet, so all of the survivor’s message data exists locally. This data is then “picked up” by a drone, piloted by a first responder, that can wirelessly join the network and download the messages. The drone is then taken back to a first responder’s base where it can be uploaded to the cloud. At that point, family members receive the messages and can respond. Then, the delivery process happens in reverse. The second half of our project involves refining the idea and developing a prototype to demonstrate from of the critical interactions. Check out the Design Execution phase of our project site to see how we built our prototypes.